“Stranger in Paradise” was the hugely popular song from the 1953 musical Kismet. 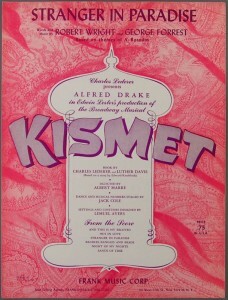 The popularity of Kismet is due in large part to Tony Bennett. 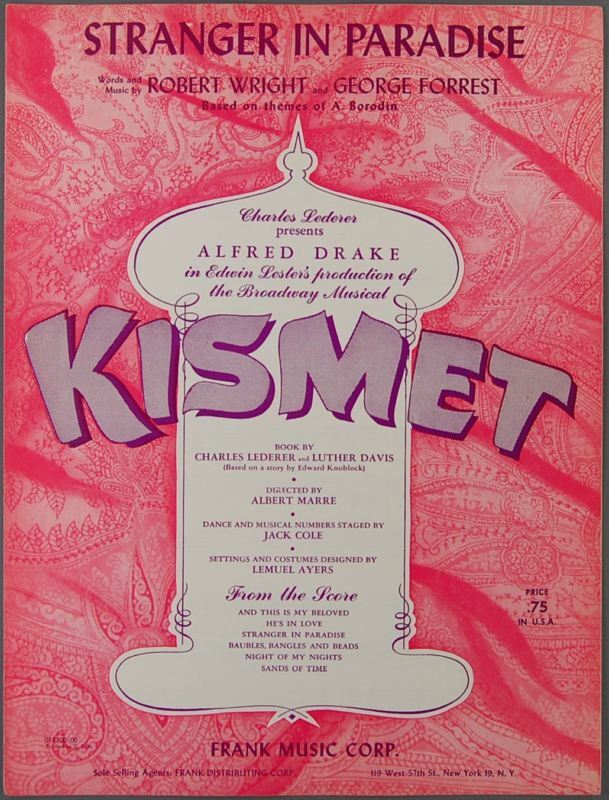 At the time Kismet was preparing to open, New York City was having a massive newspaper strike and publicizing the opening of the musical was nearly impossible. The producers asked Tony Bennett to record “Stranger in Paradise” to help promote the production. His version was a hit and so was Kismet. Won’t you answer this fervent prayer? “Stranger In Paradise” was recorded on October 13, 1953 and released that same year as a single; the same recording was used on the 1962 album Mr. Broadway: Tony’s Greatest Broadway Hits. “Stranger In Paradise” was arranged by Percy Faith. “Stranger in Paradise” was recorded live at Tony Bennett’s concert at Carnegie Hall on June 9, 1962 and was initially released in 1962 on the album Tony Bennett at Carnegie Hall. Ralph Sharon arranged the song. “Stranger Is Paradise” with Andrea Bocelli was recorded in 2011 and was released that year on Duets II. It was arranged by Jorge Calandrelli.